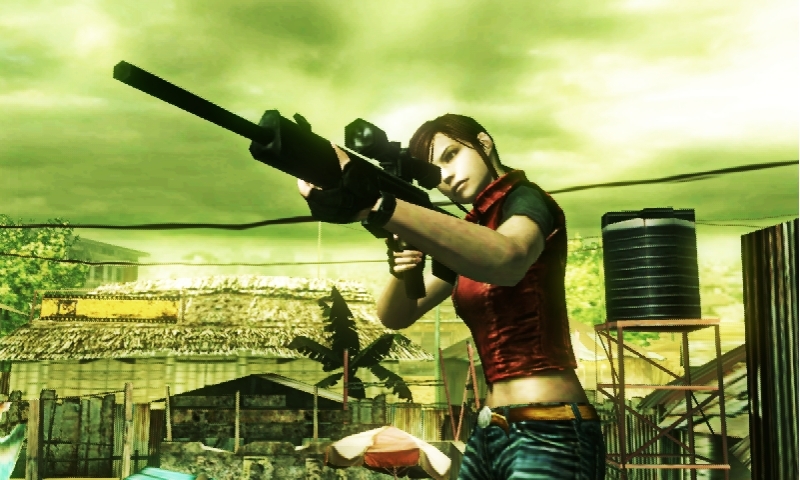 Resident Evil: The Mercenaries 3D drops the storyline and pumps in gallons of action instead. Resident Evil: The Mercenaries 3D is way more of a blast than I thought it'd be. It's just a mode from previous Resident Evil titles that Capcom brought over to the 3DS, so it can't be all that great right? The thing is, that mode happens to be fun, and it could get pretty addicting. 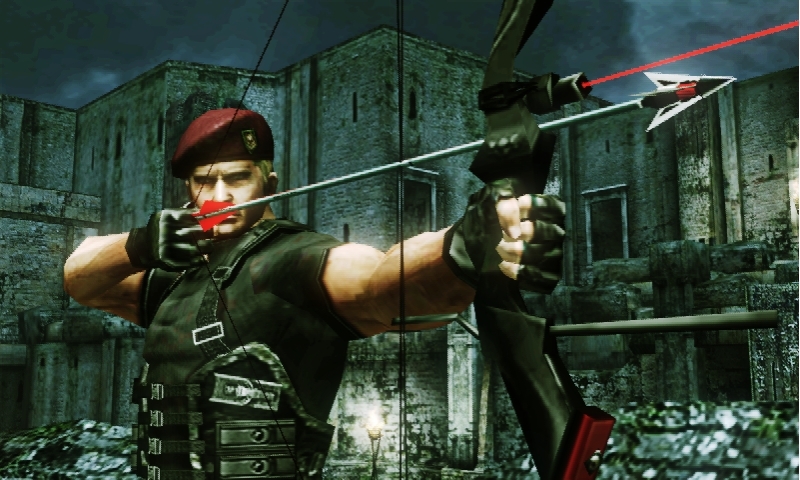 Capcom's demo of the game included four of the already revealed characters: Chris Redfield, Claire Redfield, Hunk, and Jack Krauser. Each begins with three different weapons that operate in varying ways. Jack's knife can be used indefinitely, but has a short range. Hunk comes equipped with a rocket launcher, but you sure as hell don't want to fire it at your feet. Chris is more balanced, wielding a handgun and a shotgun. These loadouts ensure that each character plays very differently. After dropping into one of the demo's two maps, I immediately noticed the gorgeous visuals. Mercenaries puts the handheld's 3D capabilities to good use when aiming and moving around, but it also has detailed textures that make the game's foes just as scary as they are on the Xbox 360 and PlayStation 3. The game mode I played was simple. I had a limited amount of time to run around an enclosed map, like an arena, to kill as many enemies as I could. Successful attacks and kills added to my time, allowing me to take out more bad guys. When each foe is defeated, it drops health replenishment items and ammunition. Players hold the R button to aim and press Y to shoot. The previously revealed ability to run while shooting is definitely real, but you move very, very slow. Still, it is helpful, and almost required for an action-based game of this type, so I'm very happy Capcom included the new ability. My first thought was to find a wall and keep my back to it, but enemies hopped over the fence onto my head. When I figured that a little shed across the way must be safe instead, the jobber zombies/possessed suddenly stopped appearing and my worst nightmare took their place. 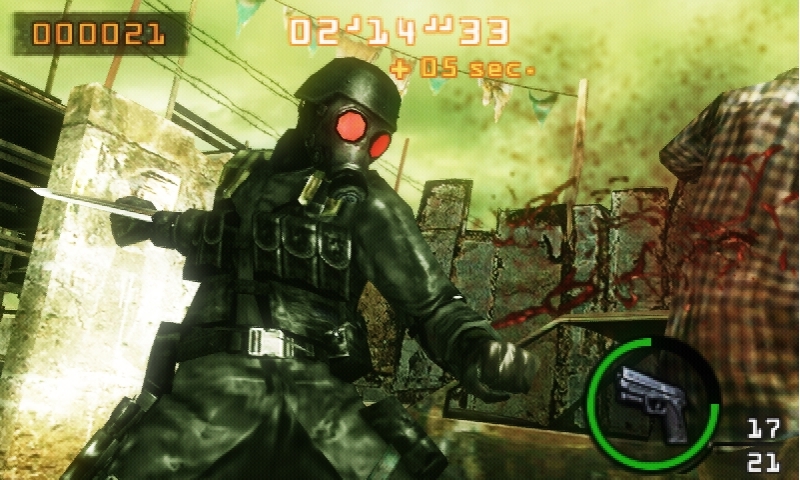 The extremely tough, bag-headed, chainsaw-wielding foe from Resident Evil 5 started coming my way, and I was still trapped in the shed. 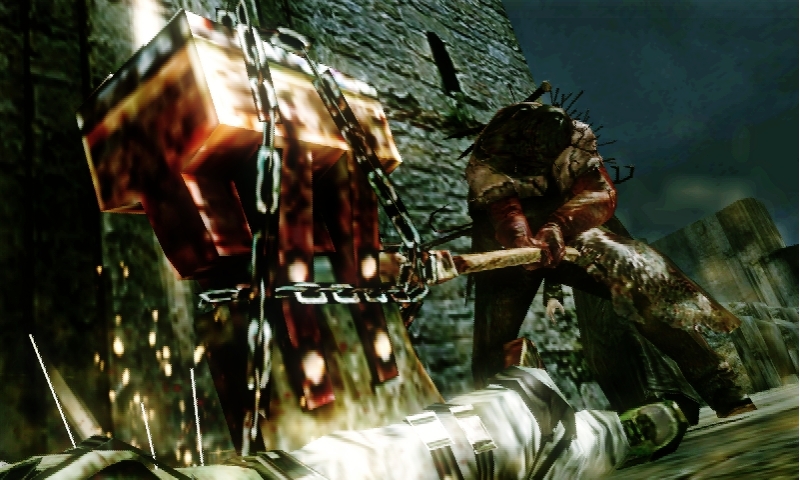 Luckily, my time ran out just as he moved to transfer my head to another location, so I lived to see another day, but I only got a C rank for the level. The longer you survive, and the better you play, the higher a rank you'll get. To get the best rankings, you'll have to work out a solid strategy. 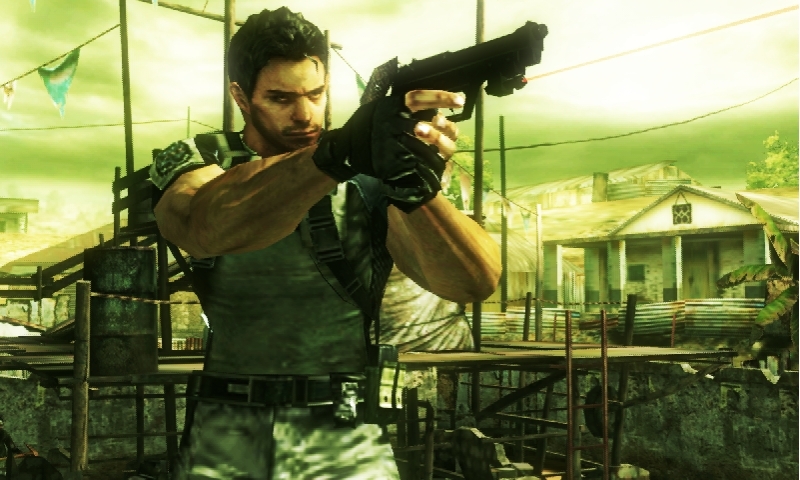 Mercenaries 3D will definitely feature more characters at launch, in addition to new modes. One of these modes features online co-op with two players, and I was also told that something else co-op might be in the works for more than two. It was hard for me to get excited about a repurposed mode transferred to the Nintendo 3DS, but I have to admit that I had a lot of fun with Mercenaries 3D. If Capcom really blows it out with hidden secrets and lots of maps, weapons, and characters, it'll be a handheld title worth taking a look at, even through the holes of a potato sack.